SmitCo Review by Rose Alexis | Smit & Co. Scented Nail Polish and Sticker Set for Kids! Disclosure: This is a sponsored post. All opinions stated are genuine and my own. You know when you happen upon that gift that you didn't even know you were looking for and you instantly know it's going to be perfect? Well, that happened to me recently while browsing Smit Co., where you will find a TON of great holiday gift ideas. 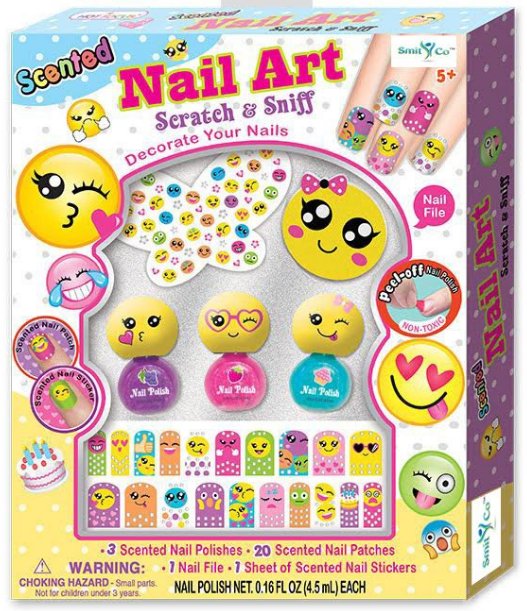 This Peel-Off Nail Polish Art kit with three bottles of colorful scented polish and emoticon stickers is going to be a huge hit with my darling granddaughter. Huge. Getting her nails painted (fingers or toes) is a big deal these days, and what better way to do it than with this child-friendly kit that is definitley made with children in mind? The stand-alone smiley face that you see in the kit is a nail file. So cute. Some of the stickers are scented (so is the polish), which adds an extra element of fun. What next? Well, I've got my eyes on the ballerina slipper earrings for my niece! You can learn more about all of the great items sold at Smit & Co. (and they have a multitude of great items) by visiting their website. You can also follow them on Facebook and/or Pinterest.